Here is a "letter" by a self-proclaimed "Evernote Ambassador." I obviously don't know anything about business meetings. Nor am I interested in making myself appear indispensable or capable of "leading," but I must say that I have no prejudice against students who take notes on paper—at least I know that they are not surfing the Internet while we are discussing philosophical matters. Nor do I, like some of my colleagues, prohibit students from using the computer to take notes. I know that some of them profit from taking electronic notes. Nor do I have anything against Evernote—it has come a long way. But "Evernote Ambassadors" ...? No further comment! And a Happy and Prosperous New Year to all readers of this blog! 1. By way of The Atlantic. The phrase "structured notes" seems to become more and more common concerns on the Internet—or perhaps it is just that I have noted it more in recent months. And I do not mean the financial instrument that Forbes called "a real stinker of a product that at first glimpse appears like the answers to your prayers but really is just one more way Wall streets is going to separate you from your money." Rather, I mean, one of those newer "pedagogical strategies" that is sold as a panacea for helping students to take "notes more effectively. It offers students a visual framework that helps them to focus on what's most important" (from some Web site or other). Here, an explanation from someone else: "Structured Note-Taking helps students take notes more effectively and assists them in recalling and retaining information that is essential. Structured Note-taking offers students a visual framework, and the mind loves pictures. Initially, the teacher provides students with a graphic organizer that goes with the organization that goes with the organizational pattern in the text to be read. Eventually, students learn to devise their own graphic organizers." Yeah ... "the mind loves pictures"—or does it? Here are some for a search on "structured note taking" program. Of course, there are some software developers active in this area as well, like Intellinote, Circusponies, Beesy, AMLPagesand a few others, but there are not many. Perhaps this will change. The Tao of Mac criticized Evernote already in 2009 for "crap for any sort of structured note-taking or draft text that requires minimal formatting or (more often) considerable amounts of revising, because it can’t even deal with simple formatting properly, let alone tables – which it does, but laughably badly – or, most importantly, outlining." Still, most of the concern is still more low-tech, with the venerable Cornell Note-taking Method being perhaps the foremost contender. I have nothing against "structured note-taking," of course. In fact, I am all for outlining, mind maps and other visual helps in taking notes. It's just that I think, as "a pedagogical strategy," it is nothing new and not a magical bullet. It's common-sense—or so it seems to me—a fancy name for what has been done since the beginning of reading and writing. 1. On of the early contenders seem to be: Smith, P., & Tompkins, G. (1988). "Structured notetaking: A new strategy for content area teachers." Journal of Reading, 32, 46-53. The interview begins with Sontag saying: "Thinking is one of the things I do." It ends with her saying that the "most awful thing" would be to feel that she had "stopped thinking". What Cott's book reminds us, inadvertently, is that talking about thinking is not the same as actually doing it. thefilename := SubStr(linestring, leftmark , stringlength)".text"
This little script "implements" only very basic functions of a personal wiki. thefilename := SubStr(linestring, leftmark , stringlength)".txt"
To use it, just enclose any word or phrase you want to use as a link in double brackets and press Ctrl-l. This little script "implements" only very basic functions of a personal wiki, not, of course, those of an online wiki. It can easily be modified for use with other formats or applications. If you use "text" as an extension, then Texts will work with it and you will have a not-so-primitive Markdown wiki (with footnotes and tables). It will also be WYSIWYG. 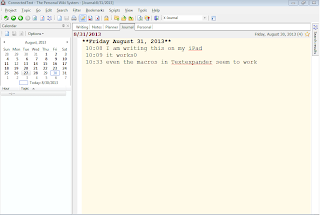 Texts is a word processor that uses text files with markdown formatting for file storage. The extension is "text". However, there is nothing in the user interface that betrays it is a markdown editor. You use Ctrl-sequences for formatting, etc. They call the application a Markdown Visual Editor: "Write using Markdown — without having to remember the markup. With Texts you can apply styles to words and paragraphs and immediately see the results. Your images and tables are displayed directly within Texts." What I like especially is that you can easily add footnotes. They translate correctly into rtf and docx. It's available for Windows and for both OSX and iOS. If I understand the Website correctly you get both the Windows and the OSX version when you pay. Right now, or "for a limited time," it's available for $14.50, that is, for a 50% discount. The iOS version is available through ITunes in Apps store for free. Oh ... and did I mention that you have to download Pandoc for conversion to other formats? It's nowhere mentioned on the Website that I could see. I like it a lot (after playing with it for a few hours—and even using it for serious work). It's a slick application. I am buying it ... in spite of David Hewson's criticism of Markdown for general writing. In any case, this application seems to escape his most fundamental criticism. Again, I agree with Hewson that "anything that claims to unlock your creativity is probably snake oil ... ask yourself. How could this possibly work?" I have mentioned the predecessor of this application before. Writer Pro continues the tradition of making nothing sound like something—and even something profound. This time, they are using a metaphor from Hans Blumenberg's "mind-bending" book Sources, Streams, Icebergs (Quellen, Ströme, Eisberge) and present a nice picture that shows how any kind of writing starts from "sources," which is of course not a particularly mind-bending insight. Here one of the sales pitches: "Writer Pro is a tool for professionals. If you write, then $20 is nothing. Hold off if you’re just interested in testing cool new apps. If you want a better tool for your work as a writer, Writer Pro is for you." If you write, $20.00 is nothing? Why? How? Whether you write professionally or not, $20 is $20, and for some aspiring writers it may actually be not affordable at all, but then again "working hard at producing something publishable" may not fit the definition of "professional" the creators of this software had in mind. For a nice review of how this useless application follows the vacuous idea of its creators, see David Hewson's review. I could not agree more (even if I have disagreed with him on other matters before). That being said, I think there is room for an application that integrates note-taking and writing in a more harmonious way. Scrivener is not it; nor is DevonThink or Tinderbox—at least in my view. 1. I have written about Blumenberg before. 2. You might also want to take a look at this. It throws more light on how far the delusions of grandeur really go. See also the outliner forum. 3. See also Michael Anderson's review. IBM Displaywriter was the first word processor I used. It was a machine that, together with the printer, took up a small room in the college I taught between 1979 and 1983. I was allowed to use it after hours, i.e. After the administration had gone home, and I had stiff competition from another professor. Displaywriter should not be confused with Displaywrite, a desktop program that emulated Displaywriter. One of the big problems with Displaywriter was the disks they used. They were the 8 inch format. When I moved to Purdue University in 1983, I had no longer access to this format. IBM was particularly useless when I tried to have the files transfer from this type of disk to 5.25 format. When I finally got to talk to a human being, he asked me how many thousands I needed to be transferred. When I said "three," he just laughed. I had to retype a whole book. This, by the way, led to a life-long aversion to IBM. I have never bought another thing from them. 1. Scroll up as well as down, if you want a more detailed history of the phenomenon. The ability to get important things accomplished in a way that honors commitments in an excellent way, respects my own time and that of others, and allows my body and psyche to focus and sustain the best mental state possible for emotional, professional, and personal well being and enjoyment. This is nothing but a bit of sanctimonious BS. Sorry, but that is how I feel. "Productivity," whatever it is, has nothing to do with "importance." And what does it mean to "honor comitments in an excellent way"? Nor does it concern "body and psyche" to "focus and sustain the best mental state," whatever that means. "Productivity" simply means "the ratio of output to inputs in production;" it is thus "an average measure of the efficiency of production" (adopted from Wikipedia). Given the author's "definition" of productivity, I expected little. But I got even less. Some fairly uncritical notes about applications everyone is already aware of, namely, Evernote, vJournal (or Journal), "built in Hotkeys for snippets on your iPhone / iPad / Computer"—really "epic" this one, Mailbox, Calendar 5, YouMail, Launch Center, 30/30, Drafts, Dropbox, Dragon Dictation, Audible, Get Abstract, Kindle, iCatcher, and Hootsuite for Twitter, clearly nothing but a time-waster. The mixture of desktop and iOS applications was also a bit disturbing to me. I should have known after I read the definition of "productivity." But even after reading the whole thing, I can't see how "built in Hotkeys for snippets on your iPhone / iPad / Computer" make you accomplish "important things ... in a way that honors commitments in an excellent way" or how a twitter client allows "body and psyche to focus and sustain the best mental state possible for emotional, professional, and personal well being and enjoyment." To end on a positive note, it may well be that someone (though I don't know who) might find this list and the discussion useful, but it isn't me (nor anyone I know). 1. I should perhaps point out that I don't think that there is, per se, anything wrong with any of the applications. Even "time-wasters" have their place, but "productivity applications" they are not. Info-base is described by its developer as "a 'clone' of the good and old "Info-Select" (Version 1.0)." It can import data from Info-Select can be imported. 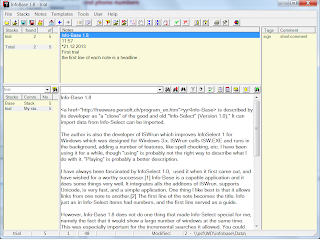 The author is also the developer of ISWrun which improves InfoSelect 1 for Windows which was designed for Windows 3.x. 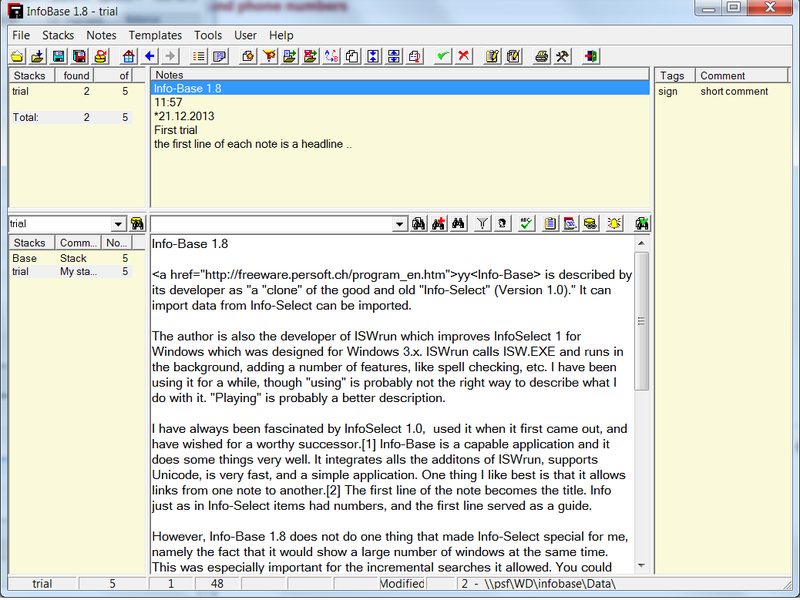 ISWrun calls ISW.EXE and runs in the background, adding a number of features, like spell checking, etc. I have been using it for a while, though "using" is probably not the right way to describe what I do with it. "Playing" is probably a better description. I have always been fascinated by Info Select 1.0, used it when it first came out, and have wished for a worthy successor. Info-Base is a capable application and it does some things very well. It integrates all the additions of ISWrun, supports Unicode, is very fast, and a simple application. One thing I like best is that it allows links from one note to another. The first line of the note becomes the title. Info just as in Info-Select items had numbers, and the first line served as a guide. However, Info-Base 1.8 does not do one thing that made Info-Select special for me, namely the fact that it would show a large number of windows at the same time. This was especially important for the incremental searches it allowed. You could immediately see a group of related items. Info-Base 1.8 functions more like a two-pane outliner with the topic titles being displayed on top and the editable note at the bottom. Since this is missing, I will not continue play with it. For this reason, and for this reason alone, I prefer Notescraps. Another thing I liked about Info-Select 1 was that there was nothing else to distract you, no outline, no list of files, etc. Info-Base 1.8 has fixed windows for this information on both sides. This makes it more busy than I would like. I wish these Windows could be turned off, like in Notetab. The help file does not work in Windows 7. This being said, the application is free, and it certainly is worth a trial, if you like plain text note-taking programs. Perhaps the multiple windows will be added in a future version. 1. See here and here. 2. You copy the address of a note while being in it and go to the note in which the link is to appear and copy the link. It is not as convenient as a wiki or free link, but it works efficiently enough. 3. Similar considerations hold for AllMyNotes which is very capable. I reported on Twine before. It is described as an "an open-source tool for telling interactive, nonlinear stories." The program is now available in version 1.4 and has undergone a number of significant changes. It's available for both Windows and the Mac. Writing is another example [of flexible habits]. The way I hold my pen and form my letters is entirely habitual. I could hardly alter my style of handwriting, however much I tried. It has become a part of me that I and others ... have to live with. ... There are also other habits involved, My style or my lack of it, which could be as much something that is tenth nature to me as my handwriting. But it is not quite automatic writing, like automatic sleep walking; the content of what I write is not just habitual. Habit does not enter in ... I can harness the collection of [my] habits to some new use, and attempt to vary it (p. 90). Habits "automate" behavior and allow us to concentrate on things other than the automated activity. This is clearly true of writing. It appears to me that this explains—at least to some extent—why many writers report that there is a significant difference between handwriting and writing on a keyboard. Thinking might seem to flow more easily and you might seem to be more creative when you rely on a firmly ingrained habit. Hell, you might be more creative when you don't have to think about how you put thought on paper (or some other medium). However, if this is true, it also means that there is no intrinisc cognitive difference between handwriting and keyboarding, between using a fountain pen and a pencil. It all depends upon what you are used to. Apparent differences can be traced to habit. I am sure that this "hypothesis" could be empirically tested. I am just as sure that I cannot test it, however. Writing with fountain pens in notebooks present problems of its own, as most of the are not really designed for this. Bleeding through and feathering are often problems. I am not the only one who has experienced serious problem with the "famous" Moleskine Brand that starts at around $15.00 on Amazon. Luckily there are alternatives that are a lot cheaper. I am thinking especially of the Black n'Red Din-A 5 notebooks (Black n' Red Casebound Notebook, Ruled, 8 1/4 x 5 7/8 Inches, White, 96 Sheets per Pad (E66857)). They are sturdily bound and even the wettest fountain pen does not leak or feather. The reason is not that the paper is better than the one you encounter in a Moleskine or other brands, but rather that it is coated. It is similar to the kind of paper used in German exercise books that I first encountered in the German exercise books during the fifties. It is perhaps also slightly thicker. You cannot even see the outlines of the writing on the other side of the page (as you can, for instance in Mead notebooks which also are made of paper coated in some way). In any case, they are very serviceable and sell for $4.88 as an add-on item on Amazon. I highly recommend them. Mind you, they have one disadvantage when used with fountain pens. The ink takes longer to dry than on uncoated paper. For this reason, I would recommend Löschpapier (blotting paper) as a place holder. This is not easily available in the U.S.A., but it is included in almost every cheap exercise book in Germany (because pupils actually still have to use fountain pens). One sheet will last for a very long time. If you do not have blotting paper, you just have to wait for a second or two before turning the page (which may be good for thinking). I have no idea why the second-to-last page contains maps for the New York, Washington, and Chicago subway systems. I glue an envelope there to use for loos papers. A Real Revolution in Scholarship? I recently read this in a comment on an academic blog about the reference manger called Nvivo. The blog entry addresses the question of "how reference managers could help ... in our thinking process rather than hold our libraries." Nvivo is described as a popular content analysis software, that is, as something that is more suited to social scientists than to humanists. The author of the blog muses: "I have only thought of Nvivo (or the like) as useful in analyzing (qualitative) data such as interview transcripts, reports etc., but the same principles can be applied to processing academic sources during literature reviews." Perhaps this is true, but "literature reviews" seem to me not much more than annotated bibliographies, and thus preparations or "necessary conditions of the possibility" of real thinking, not yet thinking itself. The thing is that all this software is great and of course would sound like a dream 15 years ago, but it is still just translating scholar’s standard activities to digital interface. It’s just a new, faster way of using old methods. It’s maybe time to think about features that have no “analog” counterpart. Tagging is one such thing. Of course an index of a book is a kind of a list of tags. But once you can filter by tags, it becomes something else, it’s not even comparable to an index anymore. It's always been my view that software and computers do just that: provide just new and faster ways of using old methods. In fact, I would be highly suspicious of any feature that does not have an "'analog' counterpart.'" I would need much convincing that it could be a legitimate method. Nor does the example given inspire much hope. Tags are a lame example. As the commenter himself admits, they are "a kind of list of tags." To say that "once you can filter by tags, it [an index] becomes something else" and is not even comparable to an index anymore" is patently false. It is not just "comparable" to an index, it is essentially an index; and such filtered indexes have been important tools in scholarship since the Renaissance. The example provides thus just another example of new and faster way of using old methods. Just to make sure, I have nothing against using computers and "new and faster ways of using old methods," just as I have nothing against outlines or outliners. I use them myself on a daily basis. Nor does it mean that that there is no technology that allows us to do things we could never have hoped to do without it (and that actually requires new methods). I am thinking about an electron microscope, for instance. 1. To be sure, that allows mathematicians to "actually" do proofs that would have been impossible for human beings because they would have taken much too long using paper and pencil, but I would suppose even they are essentially "new and faster ways of using old methods," and that would be extremely suspicious, if they were anything else. From what I understand there are some that are even suspicious of such new and faster applications of old methods. It can be had for $15.00 on eBay. The Lamy can be had for about $5.00 more. I don't know why anyone would want to buy the copy, unless she/he wants to see how good a cheap Chinese copy of a German classic can be. I can attest to the fact that it writes well, but my writing or thinking is not improved by it either. Nor can it replace my new favorite pen. 1. Picture thanks to ecclectitbits. For another review, see here. "The computer writers took half as much time to write the first draft than pen and paper writers" (2). "The computer writers had a more fragmented writing process than the pen and paper writers" (3). The explanation seems simple. It is found in the fourth observation: "Computer writers made 80% of the revisions in their first draft, as compared to pen and paper writers, who made only 50% of revisions in the first draft." In other words, a first draft on the computer is edited more than the one on paper. Whether that means it is more polished is, of course, a different story. In any case, I think such studies are more useful for studying handwriting versus keyboarding than the anecdotal evidence provided by writers themselves—no matter how famous. I cannot sleep. One of the reasons is that I had a tooth pulled today and "it" or rather the place where it was hurts. So I surfed the "Internets" and came across this. I liked it because it made me forget about the tooth. PAHK enables the use of autohotkey scripts "in python in a fully threaded way. It also lets python interact with the script at runtime." It is perhaps most useful for tasks involving macros, hotkeys or windows functions (such as getclipboard data). It only works in windows. Here is a site dedicated to reviewing note-taking software. I find the reviews helpful and to the point. While I would not give so much room to "Visual Appeal" as the reviewer does (and you might think other categories less important), the factors that go into reviewing are clearly identified and therefore useful in evaluating the review itself. No, it is not me who is reconsidering Devonthink. Here is how a historian is using it now. But see also here. The author is "still waiting for the perfect historian’s note-taking software. If only I could combine the advantages of a textbase like DT with the advantages of a relational database (and throw in a bibliographic database like Zotero while we’re at it)." Well, I am just a historian of philosophy who thinks he has found a good enough textbase in ConnectedText. As we all know, the perfect is the enemy of the good (enough). As for me "good enough" is good enough. Furthermore, I have the fairly well-founded view that the perfect is not compatible with "the crooked timber of humanity," anyway. 1. Here is how someone else is using Devonthink. What makes my approach different from that of most others I read is that I take notes of the papers and books I read, and do not keep the original PDFs of secondary sources, but just refer to my notes. I rarely consult secondary sources again. If I have to do so, it means that I did not do the job right the first time. I have written quite often on whether fountain pens and other hand-writing implements lead to different, or perhaps even better thinking than typewriters and keyboards. As anyone following the blog knows, I am extremely skeptical about such claims. This does not mean that I do not use fountain pens and very much enjoy using them. I do—and in a kind of self-experiment I have consciously made myself write every day in a notebook away from my computer desk. It has led to more writing, but, I am sorry to say: it has not led to more brilliant ideas. (But then again, I may be prejudiced and thus just not notice ...). However that may be, I discovered about two months ago a fountain pen that soon became my favorite. It is the L-Tech by Levenger. Obviously this pen is inspired by the Rotring 600 (old style). Some people have even gone so far as to claim that Levenger bought the machine tools from Rotring to make them. But this is in all likelihood false. The L-Tech looks like the Rotring 600, if you do not look closely. But is is not only bigger and heavier, but also has a screw-on cap, something the Rotrings never had. While the 600 was hexagonal, the L-Tech has seven sides. Another difference is that the Levenger has a nib unit that can be exchanged with that of any other pen of their Truewriter line. It screws out easily just like the old Esterbrook pens and any new Waterman pen. Nor are you restricted to the Levenger nibs. Edison #5 (and similar nibs) also fit perfectly. I do own a number of Rotrings 600s (as well as some Rotring Newtons) and I am extremely disappointed that Sanford (or Rubbermaid) discontinued this line. However, I must say that the L-Tech is much better than the Rotring 600 which inspired it. Levenger also made a mechanical pencil in the same style, but apparently it had problems. This is not a problem as there are various manufacturers (like Retro 51) which do make copies. The weirdest one is from a company called "Redcircle" (i.e. "Rotring" in English). They are situated in China, and they may actually have made some the last Rotrings, as their products are hardly distinguishable from the original, as far as I can see. I own some of these as well (they cost a fraction of the Rotrings and are easily available on eBay. Sadly, however, they don't seem to make me smarter either. But they look smart, anyway. 1. Before they did this, they made some truly absurd "design" choices, however; and I surmise that they closed down all of the production of fountain pens and some of the production of mechanical pencils at least partially as a result of it. 2. For a review, see here, for instance. From the VoodooPad Help File: "Try not to organize too heavily when you are initially adding information to VoodooPad. Start throwing things in around a loose framework. As your document grows you will want to spend a little more time cleaning things up. If you impose too much order too early, you may find it difficult to get started. Avoid having multiple documents when you start out. VoodooPad is great for keeping multiple areas of your life together in a single document for easy retrieval." This is good advice for any wiki. A loose framework is better than tight organization—especially at first. A wiki is not a relational database. Nor is it an outliner. Structure should emerge, not be super-imposed at an early stage. ConnectedText has evolved over the last seven years into a very versatile application that can do all sorts of things. Among these, outlining stands out. You have not only the outline view that allows you to write outlines, but also the TOC view that allows you to outline topics. So you can set it up as a two pane outliner in which the topics themselves can be outlined again. This is why some people have begun to view it as an "outliner program," that is, as a program whose primary purpose it is to outline, i.e. arrange material in a hierarchical way or to create trees. But this is not its primary purpose. ConnectedText primary purpose, as I see it, is to create a mesh or large sets of interlinked topics. It is designed to work like the Internet. In fact, it is primarily a personal wiki. And while wikis can be organized hierarchically, this is not the best way to use them. 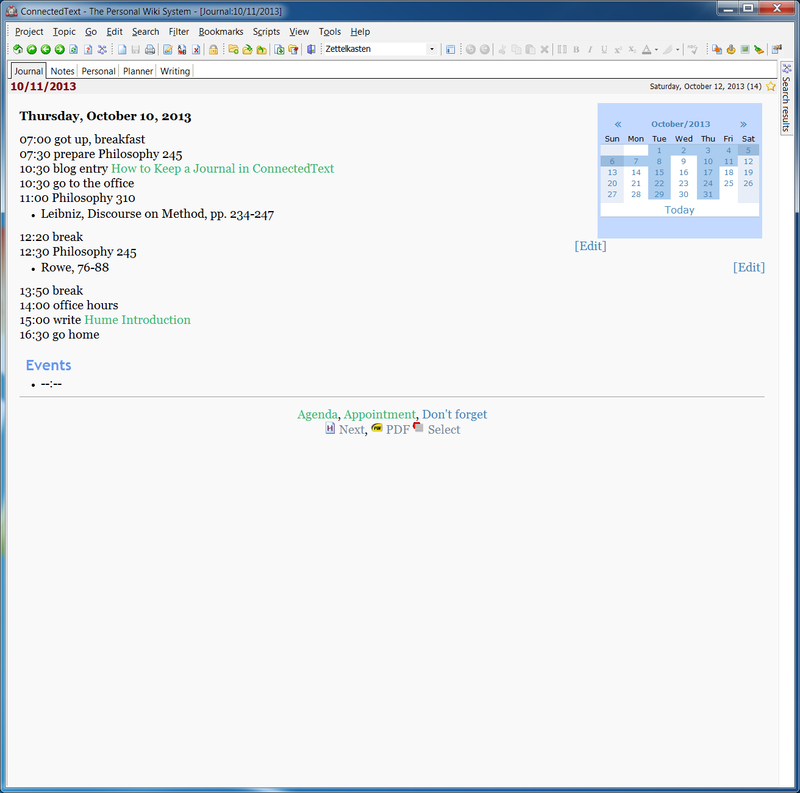 Connectedtext's outliner seems to me designed as a higher level tool that allows you to organize material for a particular job, like writing a paper on the specific subject. It is very useful because it has access to all the material you may have collected in the wiki for several years. 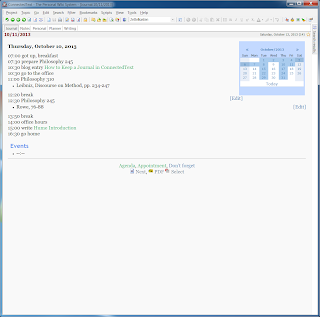 The German program which in some ways is similar to ConnectedTextZettelkasten calls such a function "Schreibtisch" or "writing desk." It's an affordance that helps you to process the stuff in your collection of interlinked topics. It is thus built upon a network of topics created first. Now, none of this means that you cannot use the outliner as the primary application, just as you can use a butter knife like a primitive screw driver. But you should be aware that a butter knife was not designed to be either a screw driver or a carving knife. 1. For an English description see here. 2. Historically speaking, the outline function came fairly late in the development of ConnectedText. 3. I learned this truth the hard way, after being punished as a kid for having vandalized some of our family silver by abusing it this way. The difference between silver knives and ConnectedText is, of course, that you cannot break the latter. Bertold Brecht once noted (in 1930) that he "thought in the heads of others and in his head others thought as well" (Er dachte in anderen Köpfen, und auch in seinem Kopf dachten andere. Das ist das richtige Denken.) This is no special accomplishment. Indeed, that's what we all do when we think—whether we want to or not. Nor is it restricted to "the political," as Walter Benjamin suggested in 1936. "Private thinking," like Wittgenstein's "private language" does not really exist. It's a myth. As I have pointed out before, Luhmann considered his Zettelkasten or slip box as his "external memory" and partner in communication with his internal memory. What are some of the advantages of external memory? Recent psychological research strongly suggests that our internal memory does not work like a filing cabinet that can be used simply to retrieve items stored independently of recall. Rather, it seems to rely heavily on "reconstructing" memories. This process is not always reliable. It is also likely to degrade over time, to be influenced by emotional factors, and subject to confusions. External memories, like those kept in a good note-taking system are not subject to such influences. They are "fixed" We can rely on them with more confidence than we can on internal memories. A similar thing thing holds for the their connections and the further growth based on such connections—or so it seems to me. Internal memories do not support creative interaction with past results in the way in which notes or external memories do. One of the faithful readers of this blog sent me a copy of the catalog of the Marbach exhibition on Zettelkästen for which I am very grateful. It is entitled Zettelkästen, Maschinen der Phantasie and edited by Heike Gfereis and Ellen Strittmayr. Johannes F. K. Schmidt reports on Luhmann's Zettelkasten (pp. 84-92). It's an informative article. Among other things, it makes clear something that I knew already—at least sort of—namely that Luhmann's Zettelkasten contains actually two strata (one from about 1951-1962) when Luhmann was a public servant, the other from about 1963-1996 when Luhmann was more interested in sociology. In the illustrated part, under "k" for "Kommunikationspartner," there are four pages of pictures. In the Introduction we find out that Luhmann was a very frugal person and therefore used bills and other documents which contained text on just on side to write his notes. Since these documents were usually DIN-A4 and his Zettelkasten used DIN-A5, he could easily cut the originals in half. In another publication I read that he even used the pictures his children had made in school for this purpose. Accordingly, the quality of the paper is uneven and often inferior. His mythological machine does not look like much. Nor does it easily give up its intellectual secrets to the uninitiated observer. Still, his Zettelkasten was (and is) a great inspiration for me, even though his theory leaves me rather cold. Here is an article that chronicles—no pun intended—the what happened to someone who was an "adjunct" for twenty-five years at a major academic university. It is too bad that the corporate university is finding adjuncts more and more convenient. It isn't just the restaurant industry that is making "living wage" a dirty word. Underemployment seems to be the future for our grandchildren. Is it any comfort that not every highly qualified academic will meet with this fate, and that some will be lucky? See here. I am fascinated by the differences! I don't think any of these "ways" would work for me. Flashcards are not really about note-taking, unless you want to commit your notes to memory and thus make them part of your very own being. (There was a reason why education in times that now seem long gone insisted on learning things "by heart." It may not be a bad idea even now, even if the texts you may want to remember are non-standard, that is, not consisting of the catechism or "standard" poetry.) But flashcards are the best way to learn things by heart. Here is a very nice post on flashcards and their various way of implementing them. It is very extensive and discusses flashcards realized in various media. The discussion of flashcards on BBEdit suggested to me a way to implement flashcards in ConnectedText. There is now way to represent the back and the front in a flashcard. However, it would be possible to create a page or several pages containing links that lead to cards explaining the concept, like [[Wohnungsberechtigungsbescheinigung]] would contain: "Die Wohnberechtigungsbeschinigung chein (WBS) stellt eine amtliche Bescheinigung dar, mit welcher der Bürger befugt ist, eine öffentlich geförderte Wohnung zu beziehen. Die wohnungsberechtigungsbescheinigung wird uch Wohnungsberechtigungsschein genannt. Sie ist für die Dauer von einem Jahr nach Ausstellung gültig ... Gesetzliche Grundlage ist das Wohnungsbindungsgesetz (WoBindG)." It means in English that this is a certification that you are eligible for public housing, or better, for semi-public housing, or apartments that were built with government mortgages. The owner can only let under-privileged people live in them until he has paid off that mortgage. I chose the example because it is neither religious nor poetic. So you could guess what the link "[[Wohnungsberechtigungsbescheinigung]]" means, and then click on it in order to see whether you were right. It would also be possible to move words or links that have been learned from "active pages" to a page that contains "concepts already learned." It would be even easier to set up than the way described for BBEdit. By the way, this way of implementing the flashcards could just as easily be done in nvALT or any other application that allows free links. 1. For Freelinks, see this link. I changed the keyboard on my Mac from the Apple Bluetooth keyboard to a wireless USB keyboard (Logitech K360). It seemed that this change did not help. However, after I turn off the Mac and restarting it (not just a soft reboot) and also turned the iPad off and then on again, everything seems to work as it should. The delete and direction keys work as they should. It appears to me that there is an incompatibility between Parallels Access and the Apple keyboard. I did install Parallels 9 and the older iPad application, called Parallels Mobile, no longer works. So, if you bought this and want to continue using it, you should probably not upgrade to version 9. Parallels now lets "customers remotely access and experience them as if they were made for iPad." This replaces the old application Parallels Mobile for the iPad which let, or rather, made you run all of Windows. It replaces an application you bought for 19.99. It is no longer available. I downloaded the new application, and it works like a charm. There are some bad reviews out there, claiming that the application is cumbersome to use. This is not true in my (admittedly short) experience. I can now run ConnectedText in full-screen mode on the iPad. 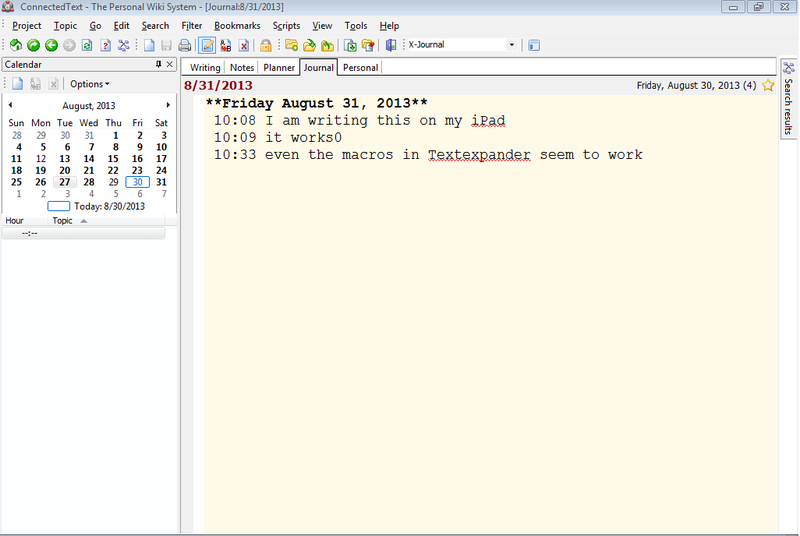 Even the macros in Textexpander seem to work. It's like a dream come true for me because that's what I always really wanted to do with the iPad: run ConnectedText full screen. There are still some bugs. Delete and direction keys don't always work they are supposed to, but I am sure that will be ironed out. I have not yet downloaded Parallels 9, but that also seems to be a solid improvement over 8. For some interesting thoughts (that do not always agree with mine) on how to set up a Zettelkasten, see this blog. Since the author commented on my thoughts on underlining, let me clarify two things: (1) I was really talking mostly about underlining in library books, and (2) I was mostly objecting to using ballpoint pen and markers when underlining (though, of course, anyone can do whatever they want with their own books. I myself use mechanical pencils to make light marks that remind me what to transcribe into ConnectedText. This is not unrelated to Luhmann's conviction that real thought must be connected to what has already been said (be anschlussfähig). preferred to pick up a pencil which produced the strokes more willingly [than the quill]; for it had happened to me several times that the scratching and splattering of the pen roused me from my sleep-walking poetic mode, distracted me and strangled a brain wave at birth. This does make sense. Anything that distracts from expressing one's thoughts, calling attention to the physical process of writing, detracts from what it is to accomplish. It's one of the reasons why the quill was superseded by the steel quill and ultimately by the fountain pen. None of this means—at least as far as I can make out—that the writing instrument //per se// determines what is being said. It only shows that it can get in the way. That media can get in the way is well known. For most Americans reading Fraktur, for instance, gets in the way of apprehending what is being read. That is why even seasoned Kant scholars find Kant's Academy edition more difficult than reading his writings in Garamond or other typefaces more common typefaces. It does not change what Kant said, however. Nor even what they take Kant to mean. But however that may be, he used a pencil when he was "in need and in a hurry." He also used it for rough drafts and ephemeral notes. es war mir einigemal begegnet, daß das Schnarren und Spritzen der Feder mich aus meinem nachtwandlerischen Dichten aufweckte, mich zerstreute und ein kleines Produkt in der Geburt erstickte. Für solche Poesien hatte ich eine besondere Ehrfurcht, weil ich mich doch ohngefähr gegen dieselben verhielt, wie die Henne gegen die Küchlein, die sie ausgebrütet um sich her piepsen sieht. [Werke: Aus meinem Leben. Dichtung und Wahrheit. Goethe: Werke, S. 11010 (vgl. Goethe-HA Bd. 10, S. 80-81)]. Imprint and Trace is an interesting book, even though she relies far too much and insufficiently critical on différance and Kittler. But many of the examples she uses are of interest to me. As Walter Benjamin said: "And today the book is already, as the present mode of scholarly production demonstrates, an outdated mediation between two different filing systems. For everything that matters is to be found in the card box of the researcher who wrote it, and the scholar studying it assimilates it into his own card index." I do not think this is true of every book. In fact, in really good books, there is a surplus of "what matters" that goes beyond my own "card index." But his indictment is certainly true of Neef's book—as far as I am concerned. I recently discovered a blog on writing instruments, called Palimpsest. In one of the posts, the author reports on John Barth's claims about writing by pen versus writing by typewriter, claiming "My sentences in print, as in conversation, tend to go on a while before they stop: I trace that to the cursiveness of the pen. The idea of typing out first drafts, where each letter is physically separated by a little space from the next letter, I find a paralyzing notion. Good old script, which connects this letter to that, and this line to that—well, that’s how good plots work, right? When this loops around and connects to that ..."
This is, of course, nonsense, strictly speaking. It's not the pen that is cursive, but Barth's hand writing. The most he could say is that the pen allows him to write cursive, while the typewriter does not. And all the claim amounts to is that he has a psychological need to write cursively. If he had been taught writing at a different time, like today, he would not have that need. Would his writing be different? Probably ... Just because his experiences would have been different. How much would the inability to write cursive script have to do with this? I have no idea, and I suppose neither has he. His plots (insofar as they exist) were not destroyed by printing either. At one time I used to keep notebooks with outlines for stories. But I found that doing this somehow deadened the idea in my imagination. If the notion is good enough, if it truly belongs to you, then you can’t forget it — it will haunt you until it’s written. Who says it was just outlines the killed ideas in his imagination? I have always been struck by the absence of ideas in his work. 1. By way of Elizabeth Browne, thanks to Flavorwire. It's not the tool, stupid (as Bill Clinton might say). I am not so sure that what happens between the brain and the pencil is independent of what has been written or is being written. On the other hand, I am fairly sure it does not matter at all whether you use a pencil, a roller ball, a Waterman, a Shaeffer, or a Parker. I am also fairly sure that it matters relatively little whether you use a fountain pen, a typewriter, or a keyboard. The methods you use to take notes or write seem to matter more. I did say that I collect mechanical pencils and own many pens, did I? In other words I find these objects fascinating, but I feel that just as a good workman does not blame his tools in failure, they do not contribute much to success. Put differently, they allow you to write, but they do not determine whether you write badly or well. There was an article in The Guardian by Umberto Eco, On the Lost Art of Handwriting. It's no longer available, but one of the things Eco says is that the crisis with handwriting "began with the advent of the ballpoint pen. Early ballpoints were also very messy and if, immediately after writing, you ran your finger over the last few words, a smudge inevitably appeared. And people no longer felt much interest in writing well, since handwriting, when produced with a ballpoint, even a clean one, no longer had soul, style or personality." I don't particularly like ballpoint pens, but this is pretty idiotic. The same can be said for fountain pens. And what does smudging have to with the absence "of soul or personality." There are those who would say that the should is nothing but a smudge. While I would not agree to such a claim either—"soul" is at the very least a coherent concept—I have no idea why writing with a ballpoint pen lacks soul or personality. For all I know, some good novels may have been written with ballpoint pens. And what about roller balls? How much soul do they impart to writing? There were apparently other interesting claims in the article, like the one that handwriting as opposed to writing with the keyboard slows you down and thus facilitates thinking. Too bad I no longer have access to this morsel of wisdom by my favorite Italian author. 1. This appears to be it: "The art of handwriting teaches us to control our hands and encourages hand-eye coordination.... [it]obliges us to compose the phrase mentally before writing it down. Thanks to the resistance of pen and paper, it does make one slow down and think. Many writers, though accustomed to writing on the computer, would sometimes prefer even to impress letters on a clay tablet, just so they could think with greater calm." Yes, clay tablets are the way to go ... obviously. "Writing by hand obliges us to compose the phrase mentally before writing it down"? Not my experience, and what about free writing? Here an interesting site that shows the marginalia with which Melville adorned his books. They show he was a careful reader. Also note that (a) the comments and underlinings are in pencil, not in ink, and that (b) they are found in his own books and not in copies from the library. Wikipedia defines "workflow as follows: "A workflow consists of a sequence of connected steps where each step follows without delay or gap and ends just before the subsequent step may begin. It is a depiction of a sequence of operations, declared as work of a person or group, an organization of staff, or one or more simple or complex mechanisms. Workflow may be seen as any abstraction of real work. For control purposes, workflow may be a view of real work in a chosen aspect, thus serving as a virtual representation of actual work. The flow being described may refer to a document or product that is being transferred from one step to another." A "workflow" involving many steps may make eminent sense when you talk about a corporation or any other large organization produces whatever it produces. The question for me is how much sense a, say, four-, five, or seven-step fixed workflow makes when you talk about efforts individual—especially as far as writing and note-taking is concerned. I am beginning to think that it does not make much sense. Yet, I read more and more about such supposed workflows, each involving a different application. I will not refer to any particular discussion, but here is one example. "Writing it up" in an rtf or html editor and final storage. A search on the Internet will bring up many variations on this theme. Some involve many more steps. I doubt anyone can consistently adhere to such a scheme—especially as far as switching from one application to another is concerned. But even if it were possible, I doubt that it leads to superior results. Writing and note-taking are not linear processes consisting "of a sequence of connected steps where each step follows without delay or gap and ends just before the subsequent step may begin." Therefore, the fewer steps there are, the better designed the approach is. At most two, I would say, and perhaps three. But perhaps what I am really saying is that the use of two applications is better than that of many. I can see, for instance, how someone may brainstorm in Scapple. Import it into Scrivener, fool around with these ideas, using the outline, the editor (and perhaps even the fake index cards), and then compile the final product. That would be two (or at most three) steps. The important thing is that you can constantly switch between "writing up," outlining and visualizing the materials without having to switch applications. It's just that there is no clearly defined sequence of steps that must be followed in a linear way. And I consider that a good thing. I have used the example of Scrivener as such an integrated writing environment, but there are other applications that allow you to do this. As I have said many times before, I use ConnectedText for everything and convert to rtf at the very end. 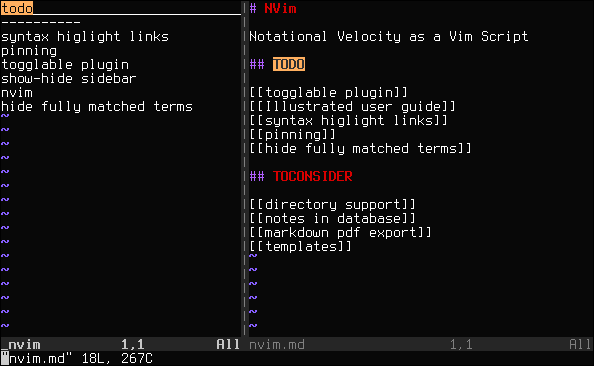 NVim is NVim is "a clone of the mac app Notational Velocity in vim," or rather "a fast Notational Velocity inspired plugin for Vim." I was reminded of "Kedit" again. I never used it and never will use it. But I have written about McPhee's "workflow" with Kedit. Here is a somewhat interesting article by John Derbyshire about his experience with Kedit, in which he coins the phrase "late abandoners." Some programs, like Lotus Agenda, Ecco, and Grandview, seem to have had a special "attraction" for "late abandoners" (and I don't know why it is outliner programs that come to mind—perhaps people who outline are one of the species of of the genus of "late abandoners," and I do not deny belonging to this species). Part of the phenomenon constituted by "late abandoners" has, of course, to do with the fact that the programs they refuse to abandon, did one or the other thing very well, but it does not explain the phenomenon in its entirety. Loyalty, habituation, and fear of the unknown—a combination sometimes called "love"—must also have to do with it. But there must be other reasons. I'd be grateful for more information. He also cites other, less memorable, examples of classification, and concludes: "Obviously there is no classification of the universe that is not arbitrary and conjectural. The reason is very simple: we do not know what the universe is. “This world”, wrote David Hume, “...was only the first rude essay of some infant deity who afterwards abandoned it, ashamed of his lame performance; it is the work only of some dependent, inferior deity, and is the object of derision to his superiors; it is the production of old age and dotage in some superannuated deity, and ever since his death has run on...” We must go even further; we must suspect that there is no universe in the organic, unifying sense inherent in that ambitious word. If there is, we must conjecture its purpose; we must conjecture the words, the definitions, the etymologies, the synonymies of God’s secret dictionary." Michel Foucault was very much impressed by this classification. Indeed, he tells us that The Order of Things (Les mots et les choses) arose from the laughter "that shattered, as I read the passage, all the familiar landmarks of my thought—our thought, the thought that bears the stamp of our age and our geography—breaking up all the ordered surfaces and all the planes with which we are accustomed to tame the wild profusion of existing things, and continuing long afterwards to disturb and threaten with collapse our age-old distinction between the Same and the Other." Inedd, in "the wonderment of this [[taxonomy]], the thing we apprehend in one great leap, the thing that, by means of the fable, is demonstrated as the exotic charm of another system of thought, is the limitation of our own, the stark impossibility of thinking that." Georges Perec correctly thinks "the abundance of intermediaries and Borges' well-known love of ambiguous erudition permit one to wonder whether this rather too perfectly astonishing miscellaneity is not first and foremost an effect of art." He then produces another mind-boggling list of kinds of animals from government publications that I won't repeat here. More importantly, he also seems to think that such lists show that there is something inherently wrong with classification. But he is just as wrong as are Borges and Foucault. These lists do not show that classification is per se problematic, but only that any attempt at classifying presupposes a certain point of view and thus makes only sense from that point of view. Borges' list is so astonishing because we cannot imagine any possible point of view from which this classification would make sense. The same holds for his list of animals based on what use of animals is prohibited by the government (though once you realize that this is the unifying principle it is so much less astonishing. Lists are just very basic ways of ordering things from a certain perspective. This has nothing to do with the way the universe is, but only with what Kant would have called "necessary conditions of the possibility of thinking," i.e. with general logic. 1. Jorge Luis Borges, Selected Non-Fictions. Ed. Eliot Weinberger (New York: Penguin Group, 1999), pp. 229-232. 2. Georges Perec, Species of Spaces and Other Pieces (New York: Penguin, 1997), p. 196. I will have more to say later about the essay "Think/Classify" in which this claim occurs. 3. See also The List. Scapple for Windows is in Beta now. It looks and works just as it does in OSX (or so it seems to me). It's not a mind-mapping application. The Beta expires September 15. Applications using the Index Card metaphor are available for the Android platform as well. There are Cardboard Index Cards and CardScape, for instance. They seem to be doing essentially the same thing as the iPad applications. Supernotecard has for a long time done the same for the desktop. As I said before, I am not sure whether this skeuomorphic approach is always the best approach. Do we really have to move around objects that look like index cards in order to outline material. Clearly not! But in this case, I am willing to admit that it might be helpful. Though the sticky notes analogy might do just as well. See Stickysorter for Windows, for instance. Another index card application for the iPad. I looked at Index Card in a previous post. I exports to "email, iTunes, or Dropbox as a formatted text file, image, PDF, or an Index Card Board file." It costs $4.99 (just like Index Card). There is also a minimalist version called "index cards®", but it seems to have a rather limited feature set (and I don't like the registered sign behind "index cards"). It's just $0.99. These applications seem to be inspired by Scrivener's cork board. They are designed for outlining, or perhaps better: pre-outlining, or moving around different passages or scenes before or while writing them up. They are not really designed for serious data storage, though they could perhaps be used for such purposes as well. McLuhan famously claims that electricity changed everything and automation is the final step in the process: "Men are suddenly nomadic gatherers of knowledge, nomadic as never before, free from fragmentary specialization as never before—but also involved in the total social process as never before, since with electricity we our central nervous system globally, instantly interrelating every human experience" (358). Only one problem knowledge is different from berries or roots. You can't pick it up just like that. Try to "gather" the knowledge of calculus, of C++, or even of RegEx. It takes a lot of concentrated work and "fragmentary specialization." "Nomadic" moving from one field of knowledge to the next does not help understanding—quite apart from the fact that the more interesting "fields" need more cultivating than ever. If anything, we have moved even further away from a "nomadic existence. I do not mean, of course, those who underline with ball point pens or just "capture information on the web" in order to "share it around." I recently picked up at Brattle for a whole dollar Marshall McLuhan, Understanding Media: The extensions of Man (New York: McGraw Hill, 1966). Perhaps I paid too much, but the book was appropriately used. Underlining in red and blue ball point point pen, many pages with a super-abundance of check marks, and inane comments thrown in for nothing. Like the claim that "post hoc ergo propter hoc" is a "confusion of cause and effect." It may well be that McLuhan is often guilty of confusing the two, but this is not the same as confusing mere temporal succession as a causal relation. The book had the reader it deserved—or so I think. I am, of course, a mere meta-reader. One of "the extensions of man" is, of course, the typewriter (258-264). Except, it turns out it that if we believe McLuhan it is really more an extension of woman, as wave after wave "of female typists hit the business office" beginning in 1890 (259). As to the typist: "She was a style-maker who was also eager to follow style" (259). And, as "much as the typewriter, the typist brought into business a new dimension of the uniform, the homogeneous, and the continuous that has made the typewriter indispensable to every aspect of mechanical industry" (259). Remember, "post hoc, ergo ..."? "An army needs more typewriters than medium and light artillery pieces, even in the field, suggesting that the typewriter now fuses the functions of the pen and the sword" (259). But, the "poet or novelist now composes on the typewriter" (260). Henry James is the example he uses: he "found dictating not only easier but more inspiring than composing by hand. 'It all seems to be so much more effectively and unceasingly pulled out of me than in writing'" (260). Nice ... but this is at best incidentally related to typewriters. Typewriters are neither necessary nor entirely sufficient for the practice of dictation. But the non-sequitur is necessary for the rest of McLuhan's account which somehow issues in the claim that E. E. Cummings used the typewriter "to provide a poem with a musical score for choral speech" (261). Just how much the typewriter has contributed by its unjustified right-hand margin to the development of vers libre would be hard to discover, but free verse was really recovery of spoken, dramatic stress in poetry, and the typewriter encouraged exactly this quality (261). Isn't it interesting that the "typewriter carried the Gutenberg technology into every nook and cranny of our culture and economy", produced also "these opposite oral effects"? Perhaps it would, if it did. McLuhan is confident just because "such a reversal of form happens in all extremes of advance technology, as with the wheel today" (262). The same thing seems to hold for "automation" or "the invasion of the mechanical world by the instantaneous character of electricity" (349). It is not an extension of the mechanical principle of fragmentation and separation of operations, but serves to unify. 1. I am glad that it is only the "instantaneous character of electricity" that invades, for electricity itself might have the opposite effect. I am also glad to find out that a "conscious computer would still be one that was an extension of our consciousness, as a telescope is an extension of our eyes, or as a ventriloquist's dummy is an extension of the ventriloquist" (351), though I am left to wonder about the "self-amputation" that accompany such technologies (see p. 45f.). "ReactOS® is an effort to create a Free and Open Source replacement for the Microsoft Windows NT® family that is compatible with both applications and drivers. The NT® architecture has always been highly flexible and powerful and its continued dominance in the computer industry means it is one of the most supported family of operating systems in existence, with its latest iteration being Windows 8. As these days operating systems are little more than gateways to applications that users want to run, an open source NT implementation would allow users to continue using familiar programs in a familiar environment. The project seeks to embrace the strengths of the NT family while avoiding many of the configuration decisions that made older versions of Windows vulnerable and maintaining a lightweight environment so that a computer's resources can be dedicated to what really matters to the user, running their applications." "ReactOS 0.3.15 is still under heavy development (alpha stage) and is not ready for everyday use." I hope it will succeed because I want to use it! I am reading David Lodge, Deaf Sentence (New York: Viking 2008). It's clever book, but it's not just clever but also insightful and, what is rare, at the same time entertaining. In it, the narrator comes across a library book that has been marked with a turquoise highlighter pen, "not just in the margins but with parallel strokes drawn right through the the lines of text from left to right." The narrator considers this as vandalism and finds it hard to believe how anyone "educated enough to have access to a university library should do this to a book." To him "the treatment of books is a test of civilized behaviour." He admits "to making light pencil marks in the margins of a library book occasionally, but [he] erase[s] them scrupulously as [he] goes through the pages writing up [his] notes." Heavy underlining enrages him. The previous borrower must have been "under the delusion that this procedure will somehow engrave the words in his or her cerebral cortex" (105f.). The offense is even more serious if ballpoint pen or a felt-tip highlighter is used. I could not agree more and would not even do this to my own books. Ballpoint pens are not tools for marking books, and felt-tip highlighters should be prohibited altogether. Yet, students seem not to be able to do without them. In fact, they seem to think that their understanding of texts is enhanced by using different colors to indicate different categories. No serious reader will do this. Needless to say, I don't own highlighters. 1. Needless to say, this episode has great significance in the novel. 2. See also here, here, and especially here.